iiNet is one of Australia’s largest and most innovative Internet service providers, servicing around 900,000 home and business customers. When the company’s growth necessitated upgrading its Perth data centre infrastructure, it sought to achieve the highest possible levels of energy efficiency and reliability while reducing its operational costs and caring for the environment. Stott Hoare, working closely with APC specialists, designed and implemented an 88 rack data centre solution for iiNet which utilised the APC InRow® cooling architecture and Hot Aisle Containment System to meet all these objectives. The proof of the integrity of Stott Hoare’s data centre solution blew in on Sunday 21 and Monday 22 March 2010, when the worst storm front to hit Western Australia in 16 years caused damage and destruction insured for more than $1 billion. Lightning strikes disrupted power supplies and at the peak of the storm more than 150,000 households and businesses were affected. iiNet’s Data Centre functioned uninterrupted throughout the tempest, and was even available to assist a nearby company avoid potential issues with its network. “Our network is the heart of our business, thus the quality of the infrastructure that supports it is paramount,” said Greg Bader, iiNet Chief Technology Officer. The iiNet Data Centre also had to meet strict noise level regulations, avoid releasing any contaminants into the environment and ensure uninterrupted power supply in the event of power outages. “Data centre infrastructure design involves many challenges,” said Brian Hawkins, Stott Hoare Sales Manager. “With energy costs rising, cooling the growing number of computers in large data centres is a primary issue – particularly in light of Perth’s consistently long, hot summers,” said Brian. “iiNet’s Data Centre is absolutely at the core of its business. As such, its reliability – and for a growing company – scalability are critical issues. APC’s InRow® cooling architecture and Hot Aisle Containment System offer one of the most efficient and flexible solutions to the key requirement of effective, energy efficient temperature control. Hot Aisle Containment enclosures isolate the incoming cold air that prevents equipment overheating from the warm ‘exhaust’ air that is pushed into the data centre aisles after cooling the equipment racks. The result is more efficient cooling with greater energy efficiency. “The APC® Hot Aisle Containment System is modular and easily scalable,” said Brian. Stott Hoare Solution Architects were able to work closely with APC data centre experts using the APC InfraStruXure™ Designer computerised data centre design and modelling tool to explore various confi guration options for iiNet’s 88 equipment racks within the data centre footprint. “We exhaustively worked to achieve the optimum solution that used best practice principles to maximise both cooling and energy efficiency, said Brian. Stott Hoare developed the most cost effective data centre possible for iiNet’s requirements, both in terms of initial acquisition and ongoing energy costs. The APC® solution also utilised a unique scalable, modular Uninterruptible Power Supply (UPS) fault-tolerant power protection system that makes it easy to adapt to changing power requirements. This certainly proved its worth during the storms of late March 2010. “Of course, once the iiNet Data Centre infrastructure was designed, Stott Hoare then effectively managed the entire supply and installation process,” said Brian. “Over a six-month period we attended weekly project meetings, coordinated timely delivery logistics and completed installation of the APC® data centre infrastructure. We even arranged removal of packaging and other rubbish from the site. 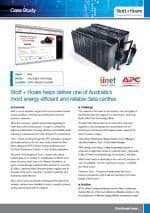 “The result of Stott Hoare’s work with APC® is that iiNet was able to implement a state-of-the-art data centre as cost-effectively as possible. testing March storms illustrates – capable of ensuring the continuity of iiNet’s business-critical services in the face of significant power outages. “What’s more, even though it meets iiNet’s currently anticipated needs, it is almost infinitely scalable to accommodate further business growth,” concluded Brian. If you’d like to discuss how Stott Hoare can provide a cost-effective and highly energy efficient APC® solution for your data centre infrastructure requirements – large or small – please contact us on (08) 9244 0000.